Today we took our precious little bundle for her first set of professional pictures, courtesy of Lisa Lacroix. It was quite the adventure. First we dressed three girls, brushed hair, braided hair, and got everyone into the van on time! That in and of itself was a miracle. Once there, Cordelia behaved beautifully. Of course by beautifully, I mean she did everything a baby should do. She ate. And ate, and ate. She peed, and pooped, all over Lisa’s blankets. She even spit down the front of Lisa’s shirt (sorry). But Lisa took it all in stride and laughed. Ella and Agatha ran around looking for Lisa’s son, and were very upset when he wasn’t around. But they managed to contain their disappointment long enough to get a couple quick photos taken. I can hardly wait to see them! My girls all looked so beautiful today. But we were slightly surprised to discover that the outfit Cordelia came home in, the one we brought for her photo shoot. The same sleeper that was loose on her 9 days ago, is snug. I had to stretch to get it on her. I don’t have any pictures from today, but here is one we took a few days ago. lol – Thank you. She full on smiles when she sees us, and giggles regularly. 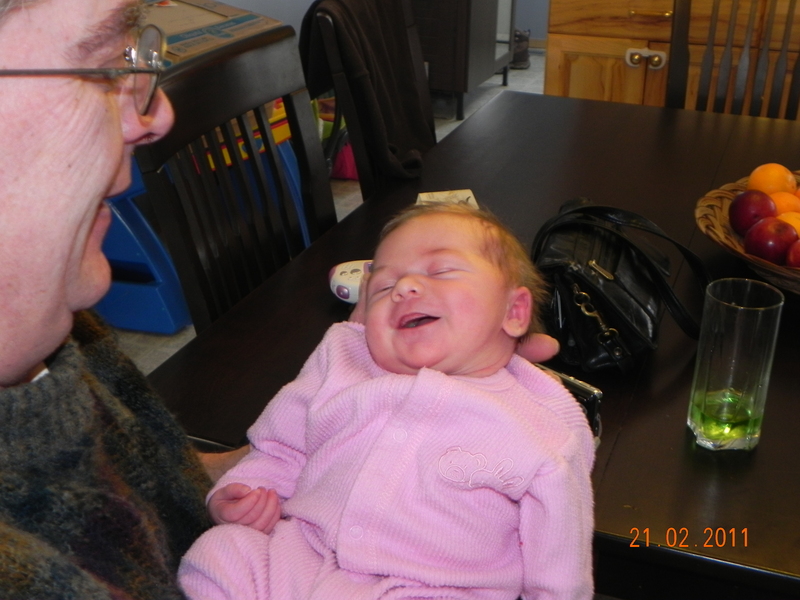 No pooping about it – this is one happy baby.